Now that the summer holidays are drawing to a close, we have the perfect opportunity to look back on all the memories to be made as a family. Exploring around the Côte d’Azur never disappoints, so Antonia will share her family’s holiday highlights. Grab these family moments while they last! The guest for today’s episode is Mother, Friend, and Energy Healer Claudia Sellegard. Claudia and Antonia have been friends for quite a while, but since then Claudia’s life has taken a pivot. Always a more spiritual being, Claudia knew that she had the ability to help her community find healing and rest through Reiki practices, Angel Card Reading, Energy Cleansing, and so much more. 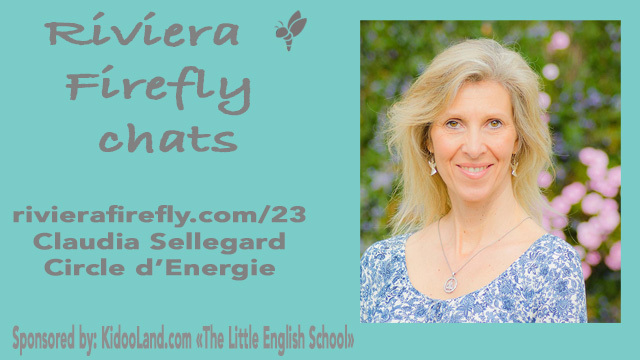 Today, Claudia will share how her Energy work is performed, why she feels such a connection to the spiritual world, and how a healthy lifestyle caters to the body, mind, and spirit. Her favorite summer holiday activities like the the MACM in mougins and the samurai exhibits at Musée des Arts Asiatiques de Nice. The importance of making cross-generational family memories. Her memory from childhood, where she heard a message from beyond. Why she fell in love with the French way of living and made the move to the Côte d’Azur. How healing through energy in her own body led to her own choice to become a Spiritual Healer. The unique holistic benefits of Reiki healing and energy cleaning. An explanation of how an Angel Card Reading session works. Her new adventures are on the horizon! Listen to find out what. Her favorite places and spaces in France. “When the body, mind, and spirit are in harmony, we are healthy.